Amish Wagon Works: Amish Tricycles for All Ages! Amish Tricycles for All Ages! Our Amish tricycles are built to last here in the USA, and they are irresistible to little kids. 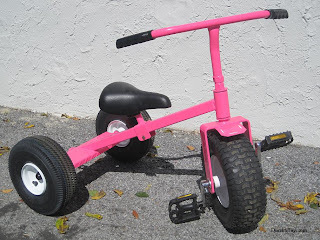 On one of our trips to the Amish shops where they make these tricycles, we about had to pry our three little preschoolers off of the trikes a finger at a time, and the kids had a collective meltdown over having to leave the trike playground of their dreams. So, what is the secret to the appeal? According to the kids, it is not just the massive air tires that give the rider that BIG-truck feeling. Massive, easy-ride air tires on a Hochstetler Tuffy trike. No, the air tires are great, but the best of the best is the all-important, much-beloved trike trailers! All of our three trike-making shops make matching trailers. Speedway Express makes wooden tricycle trailers in two sizes. Valley Road Amish Wagons makes a nice mid-sized wood trailer, and Hochstetler takes a new twist on the traditional style, and makes a trike trailer in in recycled plastic. Trikes and trailers come in multiple colors. Little brother is not about to give up his trike trailer seat! One of the things we love about these trikes is that the seat adjusts up and down the whole length of the bar. And, we like that these trikes meet a wide range of needs. We've had calls about these from moms of children with special needs, such as missing limbs, autism and Downs Syndrome. Some say that the shape of the straight Valley Road and Speedway Express handlebars has helped their children ride. Others say that the hefty, weighted feel of a chunky, heavy-duty trike works just right for their kids. Whatever the reason, we are thrilled that the trikes work well for many of these kids. As our company founder said, "Everybody needs some wheels!" And, speaking of everybody, yes, we carry sizes that work for the big kids and adults. Just see the Amish Tricycles for Adults Page. We had a grandfather call in for one of these one Christmas, saying his 11-year-old grandson was so disappointed to finally outgrow his child-sized trike that he just had to have the large one. Who wouldn't want to be the child in the neighborhood sporting the huge trike? For more information, see our Amish Tricycles and Trailers Page at www.DurableToys.com.